Next Tuesday, March 2nd, begins the 2010 legislative session. Lawmakers will return to Tallahassee with a sense of urgency to find ways to plug a $3 billion budget deficit and prepare for the expanding Medicaid rolls resulting from Florida's increasing number of unemployed and uninsured citizens. The health care budget is looking at an unprecedented $1.8 billion deficit. With the theme at the Capitol being that Medicaid is the biggest cost driver in the budget, legislators are discussing several ideas on how to reform the program. Main ideas include moving all Medicaid recipients into managed care, expanding the current Medicaid Reform pilot to an additional 19 counties, and as presented by Nursing Home Diversion Provider American Eldercare, eliminating Medicaid funding for intermediate care level residents in nursing homes and serving those individuals via the Diversion Program. As you can see, we have our work cut out for us, which is we need all our FHCA members to participate in our 2010 Lobby Wednesdays. Last week, we spoke with Darrell Jean of Consulate Health Care, who was in town for our first Lobby Wednesday. If you're unsure as to why you should participate or how your voice makes a difference, click here to hear from your fellow FHCA member about what an impact you can make on our lawmakers. Along with getting involved in this grassroots initiative, we've got members across the state meeting with newspaper editorial boards over the coming weeks to educate the media and ultimately local citizens about why we cannot drain funding from the nursing home line item to pay for other long term care services and emphasize how these suggested budget savings could put residents at risk and eliminate choice for those needing future long term care services. FHCA has more information about these and all of our 2010 legislative priorities, which you can find on the FHCA Web site. Stay informed and get involved this session, your residents and your profession depends on it. FHCA will be bringing you live updates from the Capitol this legislative session through our weekly Provider Program. With more than 20 members in town yesterday for our first Lobby Wednesday, we kicked off this season with a great interview with Kristine Schiff of Ponce de Leon, who gave us the associate member's perspective of why it is important to participate in the legislative process. We also heard from Consulate Health Care's Mark Johnson, who shared highlights from his legislative meetings as well as his overall experience. Click here to watch this week's video, and stay tuned for our next series of video updates to begin when session starts March 2nd. If you miss a week, don't worry. You can always find archives of our video updates in the Provider Program section on the right sidebar. Tuesday was an interesting day at the Capitol. It started early with a meeting of the House Criminal and Civil Justice Policy Council, which began at 8 a.m. We arrived bright and early at 7 a.m. in ancipation of giving public testimony on the proposed legislation that modifies background screening laws for a multitude of different entities. For facilities and licensees regulated by the Agency for Health Care Administration, the bill, PCB 10-04, will require Level 2, fingerprint screenings for all employees who provide personal care or services directly to residents, have access to resident living areas or a resident's funds or personal property, and for all contractors who provide personal care or services directly to residents. All fingerprinting must be done electronically, and all employees who have worked longer than five years will have to have the electronic Level 2 screening. The cost of such a screening is $24 for the state check plus $19.25 for the electronic Level 2. Then, there will be a "vendor" charge for the company that actually rolls the prints and submits them to FDLE. There's lots of details that have yet to be worked out, so your FHCA staff and lobbyists continue to work diligently with legislators and staff on these details. Since this was the first and perhaps only time public comments were being allowed, I stepped up and provided two comments for consideration: the availability of vendors to provide the screening - are they accessible by public transportation, which many of our caregivers use as their mode of transportation to get to work? Another important point of consideration is the cost of implementing such a system on July 1, 2010, which gives providers little time to detemine how to do the screening, and no system to reimburse the employer. Joe Langford, president of Edge Information Management and an associate member of FHCA and FHC Service Corp member, also testified during the meeting to ask consideration of third parties to be allowed to act as an agent on behalf of the employer. It is important that the final bill doesn't negatively impact Florida businesses. You might remember this issue began when several TV and newspaper outlets in south Florida did an investigative series that found employees with criminal records working with vulnerable persons. As a result, the Legislature has picked this up and is running with it. FHCA is in support of background screening legislation, since resident safety is our first priority. So what happens next? The bill needs to be printed and assigned a number, and it will move onto its next committee of reference. We'll continue to keep you posted on this issue, so be sure to follow us here for more information. FHCA members Consulate Health Care, Hathaway Resources and Ponce de Leon were in town today to kick off the Association's 2010 Lobby Wednesdays. More than 20 nursing home administrators and vendors who support our interests traveled to Tallahassee to help us discuss several priorities which FHCA will focus on for the 2010 session. Issues of importance include protecting the funding for nursing home residents' quality care; ensuring a cost effective delivery of long term care services while preserving Florida's economy and safeguarding taxpayers' interests; working with AHCA and Rep. Matt Hudson (R-101) on their regulatory relief bill to help eliminate duplicative requirements for long term care providers; and strengthening resident protections by ensuring background screening legislation does not limit providers' access to a qualified workforce. Also included on the FHCA Web site is the FHCA position regarding background screening legislation. The next Lobby Wednesday will take place March 10th, and if you haven't participated in Lobby Wednesdays before, don't worry! 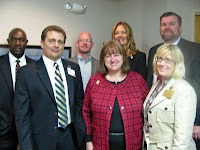 FHCA can team you up with fellow members to visit your lawmakers in groups. FHCA staff conducts an in-depth briefing to prepare you for communicating our issues effectively during those meetings, and we do our best to make your experience a success. To learn more about how to participate, click here or contact Teresa Hamlin of our staff if you have any questions.